Folding Beverage Cart Tray on Wheels from Collections Etc. $39.99 $21.97 Save up to 45% Now! 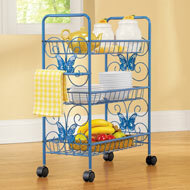 This handy two-shelf cart is great for outdoor parties, barbecues, concerts, tailgating and more. Plus, you can use it indoors for extra storage or entertaining. 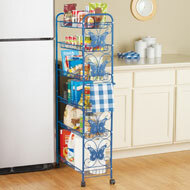 With four smooth-rolling wheels, it's easy to maneuver, features two spacious shelves and folds flat for compact storage. Simply wipe clean with a damp cloth. Plastic. 22 1/2"L x 15 1/3"W x 31"H.